Francesco Forgione was born at 5:00 pm in Pietrelcina, Italy to Grazio and Maria Giuseppa Forgione. 1/6/1903 At age 15, he entered the Capuchin Novitiate in Morcone, Italy. 1/22/1903 Investiture into the Capuchin Order taking the Franciscan habit and the name Brother Pio. 8/10/1910 At twenty-three years old, he was ordained a priest by Archbishop Paolo Schinosi in the Cathedral in Benevento, Italy. 8/14/1910 Said his first Mass at Our Lady of the Angels parish in Pietrelcina. 9/1910 Received the temporary or invisible stigmata at the family farm in Piana Romana. The painful wounds would appear and disappear. 11/6/1915 Drafted into the Italian Army. On Dec. 6, he was assigned to the 10th Medical Corps in Naples. Due to poor health, he was continually discharged and recalled until March 16, 1918 when he was declared unfit for military service. 9/4/1916 Assigned to Our Lady of Grace Monastery in San Giovanni Rotondo. 8/5/1918 Transverberation of his heart, causing a visible wound on his chest. 9/20/1918 Received the visible stigmata while praying before a crucifix in the monastery church of Our Lady of Grace. He became the first priest in the history of the Catholic Church to bear the stigmata. 5/15/1919 His superiors call for the first medical examination of his stigmata by Dr. Romanelli. On July 26, 1919, he was examined by Dr. Bignami and on October 9, 1919 by Dr. Festa. 7/31/1968 His Prayer Groups are given official recognition by the Vatican. 9/23/1968 Padre Pio died at 2:30 am. 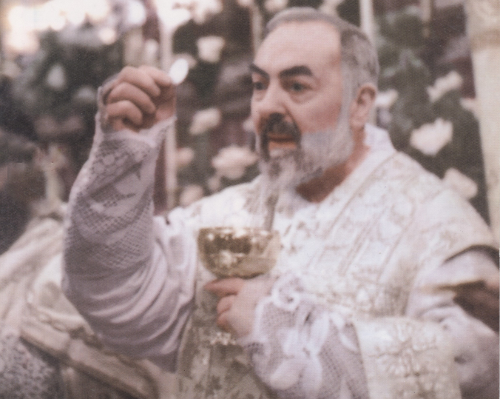 His last words were, “Jesus, Mary.” The Father Guardian of the Monastery stated that ten minutes after Padre Pio’s death, all traces of the stigmata on his hands, feet and side had disappeared. 12/21/1998 The scientifically unexplainable healing of Mrs. Consiglia De Martino of Salerno, Italy, needed miracle for beatification, is approved by Congregation for the Cause of Saints. 12/18/2000 The scientifically unexplainable healing of 7-year-old Matteo Collela of San Giovanni Rotondo, Italy, needed miracle for canonization, is approved by Congregation for the Cause of the Saints. Patron of Civil Defense Workers Every year, eight million pilgrims visit the monastery of Our Lady of Grace in San Giovanni Rotondo, Italy to pray at the tomb of St. Pio of Pietrelcina. As a place of pilgrimage, St. Pio’s shrine is second only to Our Lady of Guadalupe in Mexico, in its number of annual visitors.